The intellectually curious, socially conscious, community-focused, and globally minded gathered at Somervilleâ€™s Center for Arts at the Armory yesterday for the areaâ€™s very own TEDx event. From Mayor Joe Curatoneâ€™s spirited welcoming remarks to the Emperor Norton Stationary Marching Bandâ€™s glorious send-off, the day was a monumental success. TED is a series of global conferences centered around â€œideas worth spreading;â€� and TEDx conferences are independently organized under a license from TED, with the condition that they adhere to rules stipulating format, duration, and number of attendees, among other things. TEDxSomerville focused on a theme of â€œCreative Economy, Sustainable Community,â€� and it was clear from the start that the event was a Somerville love affair: The speakers and attendees were all deeply invested in their community, and they came to the event to think about and discuss grassroots improvement efforts. Each speaker brought one big idea to the table. Here are some of the ones most worth spreading. Lenni Armstrong told the audience that 77 percent of Somerville is covered in non-permeable surfaces. Her presentation, â€œDepave the Way,â€� highlighted the damage that an over-abundance of pavement has done to the ecosystem: Natural drainage and filtration systems donâ€™t function, the water cycle is disrupted, raw sewage is dispensed into the ocean, and soil becomes less fertile. Armstrong shared the story of a backyard depaving and suggested that Somervillians turn unnecessarily paved areas -- including the â€œno parkingâ€� zones adjacent to fire hydrants -- into green space. Daniel Hadley, from the City of Somerville and ResiStat, explained that through his work administering a happiness survey to Somerville residents, heâ€™s observed correlations between residentsâ€™ happiness and factors like tree density and neighborhood aesthetics. He said that he hoped his first-in-the-nation happiness survey would become a model for communities all over the country. In her talk, â€œBreaking the Silence: The Power of Story,â€� Kelly Creedon shared the stories of Boston residents struggling to keep their homes during the mortgage crisis. The touching stories, told in part through striking photographs and audio clips, took the audience on a journey through tragedy, vindication, and triumph. Creedonâ€™s potent message that individuals can organize and overcome by way of telling their stories gripped and inspired the crowd. Alex Feldman demonstrated the power of non-verbal communication -- â€œprimal talk,â€� as he called it -- though a hilarious performance in a made-up language. He followed up his act with a discussion of the power of body language and gestures in life, love, and work. â€œI want to make one thing incredibly clear: I can open your lock,â€� said Schuyler Towne, locksmith extraordinaire. He waxed poetic on the power and symbolism of locks, sharing historical lore and love stories in which the right key made all the difference. â€œLocks are powerful tools in the hands of dissidents,â€� Towne said, and he boasted of his fastest competitive lock-picking time: two seconds. Before the lunch break, attendees watched and listened as Jenee Halstead, a wonderful singer-songwriter, thoroughly delighted the crowd with her folksy, ultra-personal music. â€œ[In my music,] I tell people secrets,â€� she said. Ross Lohr, a social entrepreneur and founder of Project Repat, cautioned that â€œgiving away things for free in Africa plays into an incredibly patronizing form of developmentâ€¦.If I start giving away shoes for free, what happens to the local cobblerâ€™s business?â€� Simply and eloquently, Lohr explained why a better path to sustainable development in developing countries is to empower entrepreneurs, foster trade, and encourage an exchange of goods. Aatish Salvi poignantly described how the American government disincentivizes the accumulation of assets by poor people by withholding benefits if they begin to earn more. Georgy Cohen gave a heartwarming talk on reuniting with long-lost family, and Sam Sommers expounded on the power of context in our daily lives. The after-party at Davis Squareâ€™s Saloon offered the perfect opportunity for attendees to mingle with the presenters, and the combination of a gorgeous venue, free eats, and cheap Pretty Things beer made for a happy end to a stimulating day. The TEDxSomerville team and their partners deserve all the credit in the world for an impeccably planned and beautifully executed event. 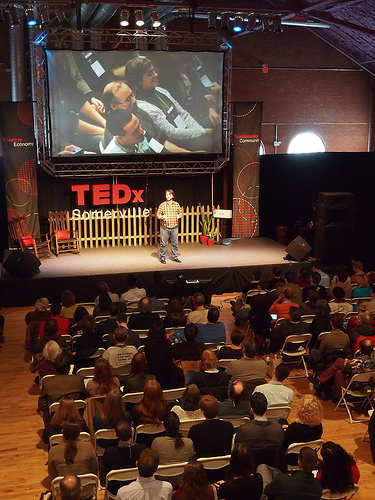 Did you go to TEDxSomerville? Who was your favorite speaker? About Max -- Max Chalkin is a recent graduate of Tufts University and is currently working in biotech marketing. His interests include entrepreneurship, technology, politics, food, and nightlife. He is an avid photographer, cook, and scuba diver. Want more TNGG? Send us an email. Go to our main site. Follow us on Twitter@nextgreatgen. Like us on Facebook. And subscribe to our newsletter!